When you’re renovating your house and realize that you have a lot of areas to cover, one of the things you always ask yourself is “How can I make this project easier, faster, and inexpensive without sacrificing the quality of my work?” Luckily, there is a way. We’ve come up with a list of best one coat paint to help you with your dilemma. Painting requires time, effort, money, and patience. Knowing how to do it right the first time will help you avoid drawbacks. In this article, we’ll give the lowdown on one coat paints and why it is highly recommended by a lot of professionals and users. Let’s face it, decorating your house isn’t cheap. Most likely, you’ll spend a lot on the materials, supplies, and laborers. However, if there’s one thing you can save on, it’s going to be your painting job. Painting is one of the most inexpensive ways to improve the overall appearance of your home. It has a direct and instant effect on the look and feel of your home. You can actually learn to paint your walls, ceilings, and furnishings without hiring professional painters. Don’t let this intimidate you because it is something that you can easily learn through practice and research. In fact, there are a lot of online tutorial videos that can guide you. One of the smartest ways to save money and energy is to pick the right kind of paint. Don’t be confused because there are a lot of paints available on the market today. They differ in type, purpose, material, and style. Here are some factors why using a one coat paint is more beneficial, practical, and reasonable. No matter which type of paint you prefer, just make sure you use a high-quality material to preserve whatever object or surface you are painting on. High-quality paints are actually more economical in the long run because most of the time you are only required to use fewer coats. This saves you back on expenses and effort. One of the things you should look for is how well the paint will hold up against different kinds of stains. Some paints are built to resist grease, oil, water, and other forms of pigments that can possibly damage your paint. In general, there are fewer one coat paints sold in the market especially since most painting jobs require at least two coatings. However, consumers are looking for more options to address the cost issues and therefore, manufacturers came up with the solution of formulating a one coat paint. The concept behind this is to produce a paint that requires less work as well as less consumption of the paint itself. If you are painting over a surface using the same color palette, then a one-time coating may get the job done. Most one coat paints are categorized as latex paint and are water soluble. They tend to dry quicker than the regular latex paint. If you want your stretch your money’s worth, the Amitha Verma may be a good choice for you. The Amitha Verma paint has a thick and creamy substance that allows you to paint any surface with just one coating while providing a full and smooth coverage. This chalk paint doesn’t require any preparation work such as stripping, sanding or priming which immediately saves you time and energy. All you need to do is clean the surface and you can start painting on it. 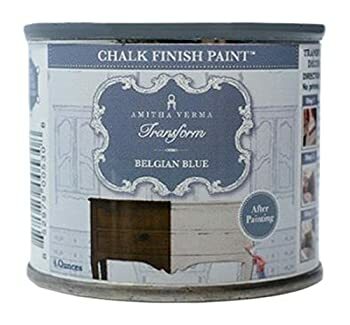 Unlike other brands of chalk paint, this paint dries as fast as 20 minutes. This allows you to finish your painting job in less time. One quart of this can go a long way. I ordered a quart of paint and was able to use it on several pieces around my house including a nightstand, dresser, headboard and cabinet. I still have some paint left for my bookshelf. It is very easy to apply and provides a smooth and even finish which looks beautiful on any surface. Although it provides a cool vintage look which I absolutely adore, I ended up using two to three layers of paint in some of my furniture as opposed to its one coat selling point. • Although it provides a cool vintage look which I absolutely adore, I ended up using two to three layers of paint in some of my furniture as opposed to its one coat selling point. 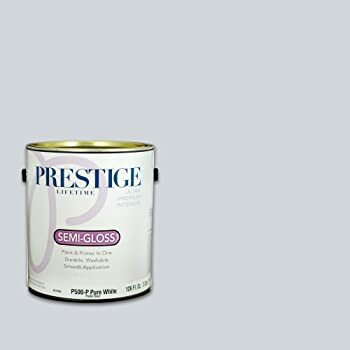 If you want a high-quality paint at a reasonable price, the Prestige Lifetime interior paint and primer in one may be a solid contender. It is formulated with premium and high-quality materials which make any room look professionally painted. I tried using this on my daughter’s bedroom and I was so pleased with the result. It covers twice as much compared to other paint and primers I’ve used before. The paint goes on smoothly in every application which reduces any potential errors. It contains low VOC which makes it safer to use especially inside your home. The paint brushed on nice and thick giving my walls an even coating. It effectively concealed the hot pink mess in my daughter’s bedroom. You can easily clean it up with just soap and water. The paint color may be close to what you are aiming for but it isn’t always spot on. 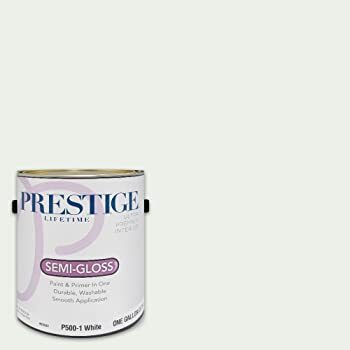 The Prestige Lifetime interior paint and primer in Pure White may be a good choice especially if you are looking for a product that provides excellent quality. This paint is VOC-free and does not contain any toxic materials making it friendly to the environment. It rolls on flawlessly and easily so you won’t have any problems while applying it on various surfaces compared to other brands. With its smooth and even application, you won’t have to worry much about leaving any brush strokes on the paint. I used it on my kitchen wall with just a single coating and it worked great. The color looked very nice on my wall. The paint spreads on evenly and has a nice consistency to it. Therefore, it doesn’t easily drip, unlike other paints. The paint color sometimes varies. In some occasions, the color tone is a few shades off. 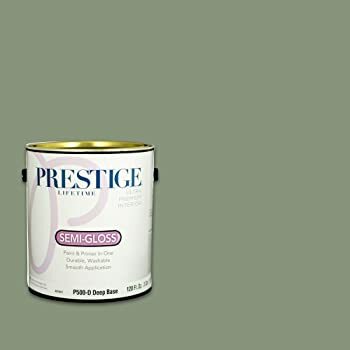 For interior painting jobs, the Prestige acrylic latex paint may be an appropriate choice. You can use it to cover drywall, plaster or previously painted surfaces. I used it to conceal some water stains on my kitchen counter and it did a pretty swell job. Just make sure you use an additional stain blocking sealer. I asked my son to redecorate his desk with this paint because it already had a lot of scratches and pen marks on the surface. It was indeed an eyesore for me and even though it was his first time to paint, he was able to complete his first painting project flawlessly. Now, he uses it to redecorate his other bedroom fixtures. I don’t have any complaints when it comes to the quality of this paint. It has a nice and thick consistency that goes over effortlessly on any surface. It serves as a good foundation if you are creative enough to create your own mix of chalk paint. You can combine it with Plaster of Paris to produce your own blend. In some instances, the color of paint may have a tendency to be a little bit bland. 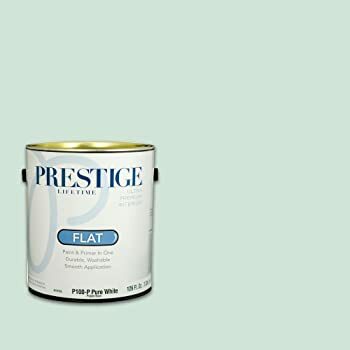 For painting tasks that require a flat finish, the Prestige interior paint and primer in flat white may be a suitable choice. Since it has a flat or matte finish, it looks great on various surfaces especially since it has a softer and smoother effect. I tried using it on my kitchen cabinet and drawers and it gave it a nice uniform look. You can use this to conceal any imperfections. It did a great job of hiding nail holes and scratches on my kitchen cabinet. Since it has a flat finish, it makes it easier to use for touch-ups. At the same time, it requires less coating than a semi-gloss finish. In this case, all you need is a single coating. The paint is easy to mix and provides a nice and even consistency. You can easily clean the surface using warm water and soap. The paint color may appear lighter than the original hue. When it comes to one coat paint application, these five brands stand out from the rest. However, there is indeed one product that appears to have an edge over the other competitors. The best one coat paint that we highly recommend is the Prestige Interior Paint and Primer in Flat White. In terms of consistency, thickness, and coverage, this paint does a great job of concealing imperfections in just one coating. The paint rolls on smoothly while providing enough coverage on any surface. Plus, it’s easy to mix and apply making it suitable for beginners, advanced, and professional painters.